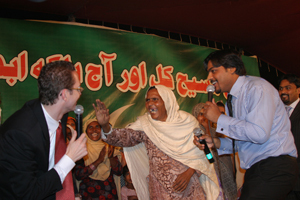 In the middle of november Pioneer Mission together with Micael Lahtinen, evangelist from Gävle, Sweden and a local organization arranged a festival in Pakistan. 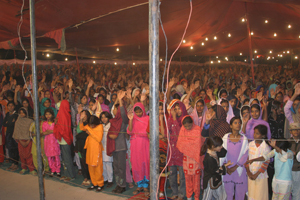 For five nights festival meetings were held where the message of Christ was in the center. People gathered and many were touched; spirit, soul and body. 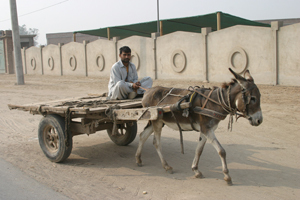 A team of five swedes went to Pakistan. - We have had a wonderul festival, Mikael Boman says. It was "cold", they had to put up a big tent in order for people to come. But for us it was like a pleasant swedish summer evening, around 15-18 degrees. 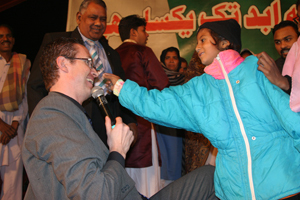 The festival was held in a smaller village, about one hour from the city of Faisalabad. 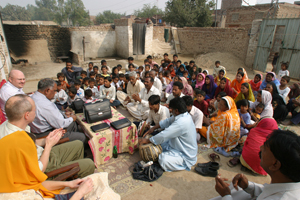 A small christian community lives in one corner of the village. The rest of it, which is the majority, are muslims. - The first night people were a little bit hesitant, Mikael continues. But for every night the atmosphere was changed. The hunger and the expectation grew for every night. 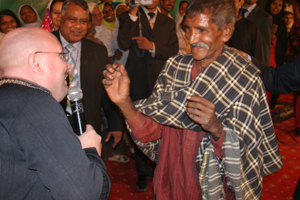 tumour as large as an egg on her neck was healed. Jesus touched her and the tumour was gone! - More and more people came, as the festival went on, Mikael says. Around 60 % of the people were muslims. More muslims testified of healings than Christians. - The last night was wonderful. I preached a message about the bloodcovenant, why Jesus the Son of God had to die. Couldn´t God just forgive? He is the God Almighty. Isn´t it enough just doing good works? But the problem is that our good works never can reach up to Gods standard. Jesus was sacrificed on the cross and his blood paid the price. That sacrifice is enough paying for all people´s sins. Muslims know about sacrificing, they are for example sacrificing lambs in Mecka. - The people were listening attentively that night. I challenged the people to commit themselves to Jesus and follow him. Many ran forwards and confessed their sins and wanted to follow Jesus, the lamb of God who takes away the sins of the whole world. Now the local organization is doing the follow up. They have a goal to establish 5-7 housechurches. - It was so good seeing the openness there is among nominal Christians and muslims. - The harvest is ripe! Pray that the Lord of the harvest will send out laborers unto the harvest, Mikael ends.